Topic: Question, Have you ever seen an all machine sewn Yukata? Topic: Yukata patterns always repeat? Topic: What's enough fabric for a chu-furisode? What about an inside-out metal can, such as a Coke one? GoldenPhoenix-san, Oh wow, where could I find silver metallic paper that is thicker than aluminum foil? Scrapbooking supplies? Tahanala-san, Thank you very much! That link is good. I didn't think about Mizuhiki strings. Any idea about the larger pieces like the band around the pony tail below the mage of the Geiko-san? 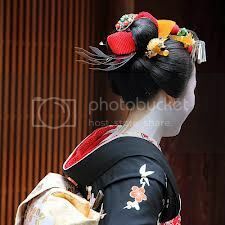 Or the double strips from the back for the Maiko's misedashi hairstyle? I believe the "strings" pointing up on the geiko's katsura are mizuhiki, silver one. Better wait for a second opinion, though! Sorry I didn't see your post. Yes I have a wareshinobu katsura. :kawaii: But it was originally a theater wig that was (what appears to be) professionally restyled and I got it on Noppin. Miu-san, Thank you very much! Do I mean to infer that you have a Wareshinobu Katsura? If so, where did you get it? Hi! How long do the paper ribbons stick out of the back of the mage or bun part on the hair for Misedashi for Maiko-san? good question.... XP, the only thing I can think about is some serious sanding starting with somehting like 600 grit and working your way down to 1800 grit??..... perhaps some kind of paint stripper? Stupid question... how do you get rid of the paint on the outside? unfortunately, the ones we have here leave little dents! how do i remove them? moonblossom wrote: Metal snips would probably be the best, they'd take less pressure than scissors. Most hardware or large craft stores will have them. Metal snips would probably be the best, they'd take less pressure than scissors. Most hardware or large craft stores will have them. hello IG forum!! im backkk! i have missed you lots!! so, im planning on making bira bira with aluminum cans.. but im not sure on how to cut them and with what! can you please give me some help on my project? Topic: How Does The Moderating Process Work?